Written by Jane Morgan on September 20th, 2016 October 23rd, 2017 . Customer journey mapping uncovers the myriad of ways customers touch; your people, your processes, your marketing content and your solutions. And, as with anything new, getting started is easier when you have a sense of what the outcome is like. 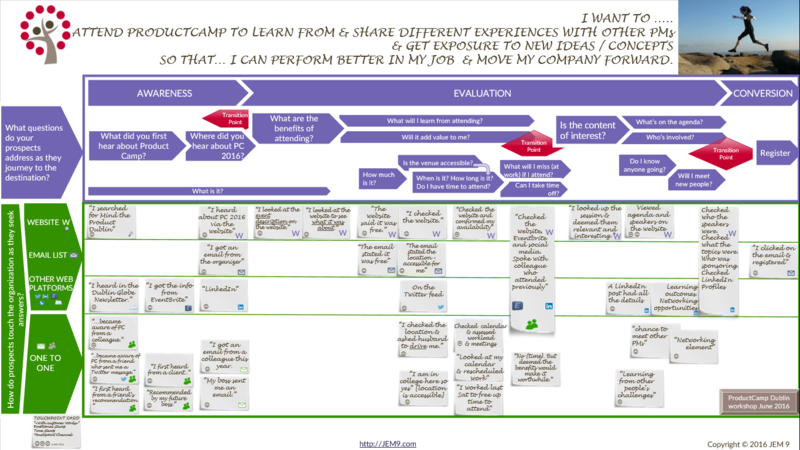 Maybe you’re looking for examples to introduce the idea of customer journey mapping to your team (or even your boss). Perhaps you just want to get a sense of it yourself. Grounded; meaning keep it real, make clear. Inspirational; meaning stimulating and creative, and also practical. For each map a ‘be inspired’ section is included. Excellent: You be the judge of that one! Imagine how these B2B and B2C customer journey maps will enrich your understanding of customers to inspire new service development and better answer prospects questions. 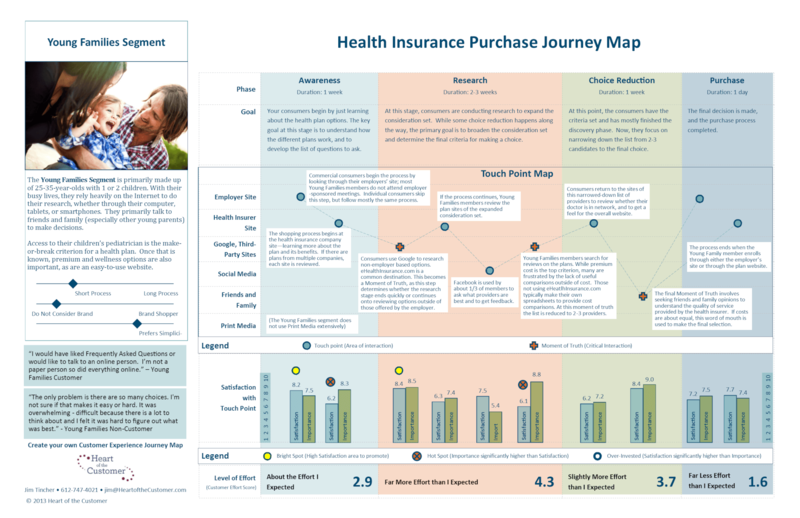 With lots of details, this B2C customer journey map from Adaptive Path (who now work for Capital one exclusively) is professionally designed with lots of detail. Structured with the customer journey phases clearly mapped across the top, the map starts with ‘research’ and continues through service usage, until the customer is safely home. A reminder to think comprehensively through to the journey’s natural end. Thinking, doing and feeling provide rich insight into a multidimensional experience. The map depicts a core challenge for today’s business leaders and marketers; frequently the journey to purchase is not linear. This map moves beyond acknowledging the ‘as is’ situation and looks at areas for process and service improvement as noted under the ‘opportunities’ section. The customer persona is lacking some detail. Different age groups and budgets likely have different needs. This depiction is difficult to read on screen; a reminder to ensure your map is easy to share and read (for a larger version click the image). As a strategic business planning and marketing document it should be easily accessible for your whole team from product development through after-sales service. customized phase names from ‘booking’ to ‘post-travel’. immediately recognizable touchpoint symbols which negate the need for a legend. overriding ‘guiding principles’: what concepts add core context to your customers’ journey? 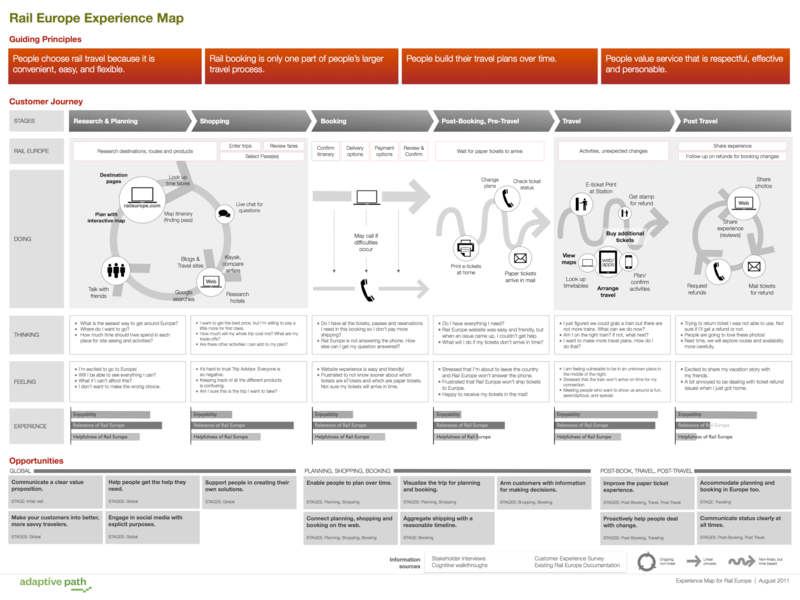 Above all customer journey maps provide a visual of the customers’ experience. Most, like this one from Solutions Through Research, depict a flow from left to right. In our multichannel communication world, this example includes actual communication touchpoints from email, social media, technical support, and the core productivity tool of every professional -> the calendar. There is no loss of customer context. A huge amount of qualitative detail is easily communicated. It took a lot of work to refine to this level of clarity. the ‘brand happiness’ metric: can you include your Net Promoter Score or similar at each point through the customer journey? the communication examples: can you show actual examples of customer touchpoints? the presentation. I absolutely love Amy’s communication: details without compromises. Click through the slides below to experience this communication joy. In marketing everything starts with understanding customers. This map from Heart of the Customer make the target customer persona front and central. Don’t assume everyone is familar with your product development / marketing speak. Questions are explict, and different at each stage. Each communication channel is clearly depicted in it’s own row. Both formal and informal channels, only some of which the company controls, are included. I love this: so close to the real world. Tell a rich story. But tell the right story. Qualitative data puts meat on the bones. And helps you decide where to focus. explicit description of the customer persona for shared understanding. satisfaction at each touchpoint. What existing organizational metrics can you incorporate? Ground your new customer journey in the existing organizational narrative. Focus on areas which result in weaker customer satisfaction. 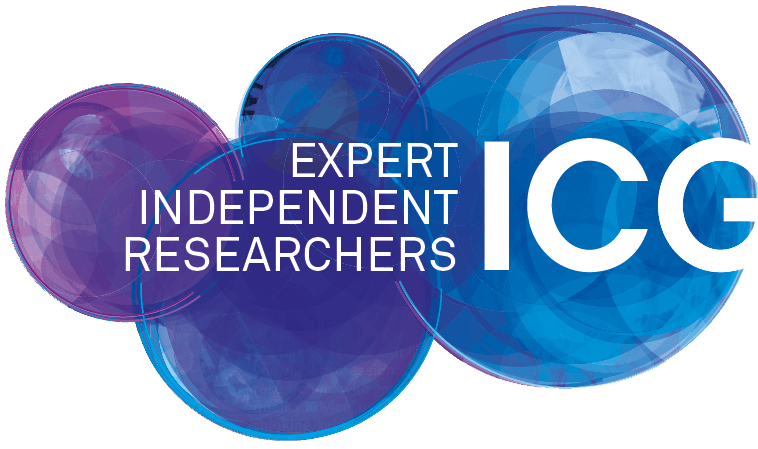 qualitative and quantitative data sources to tell a rich story, and the right story. Journey mapping typically starts with assembling knowledge from a variety of data sources. Nothing beats listening to and observing voice of the customer. 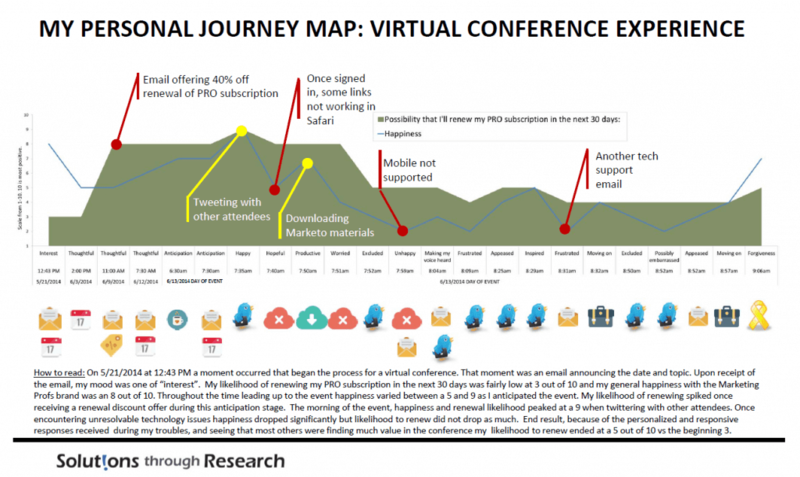 In this customer journey map example from ProductCamp participants contributed their personal experience of the journey from awareness of the event through to registration. Whether exploring how pre-sales or existing customers interact with your teams, processes and solutions, working across multiple channels / functions helps identify key transition points where customers can get lost “off road”(noted here in red diamonds). Anticipate what process bumps and information pot holes exist, and go fix them. organize and reorganize the information for insights, (in this example by separating into communication channels you do and do not cannot control). highlighting transition points where there’s a risk of losing prospects. Joyce Hostyn of Designing Change has some examples of customer journey maps including an interesting format from Lego called the “customer experience wheel”. Be inspired to design in a “WOW” moment. So where do you want to go from here?